•Beats are for listening/promo purposes only, but feel free to pass your copy around to your friends to spread the word! •Side A: 26 beats + Side B: 29 beats = 55 beats total! That’s over an hour and a half of bangas! 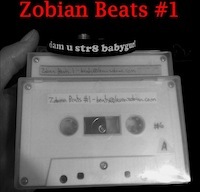 •Great for “bumpin’ in yo’ whip” and “freestyle seshZ”, etc.! Limited tapes available, so cop DAT!